Earlier this month I wrote about the absence of Thanksgiving in the face of Christmas consumerism and promised we would covered a Thanksgiving themed film. This is the film I was speaking of but I’ll admit it’s a bit of a stretch. The only real connection this film actually has to the holiday is that it takes place on the way to Thanksgiving dinner. In truth, up until the end it tends to feel more like a Christmas film because of the snowy setting the main characters travel through. They are on the way to Thanksgiving though and we do see them eat turkey so I think it still counts. I remember watching this movie when I was a kid and it was first coming on HBO in the early 90s. For years afterwards I had wanted to see it again but had forgotten all about it until coming across it again a couple of months ago. It’s a funny movie but at times it does get a bit too real and turns from funny to awkwardly dramatic. Still, there is value to be had in any film made by John Hughes and this one has his stamp all over it. When I first revisited this movie the first thing that came to mind was the obvious resemblance that Ethan Embry playing the part of Doyle had to the film’s writer John Hughes. Let me know if you see it. It’s there right? It gives me the impression that John Hughes actually was this kid Doyle at one point in his life. I don’t know this because admittedly I do not know much about the life of the late John Hughes other than the films I have seen from him. There does seem to be a pervasive correlation among many of his films which makes me think he probably took plenty of chapters from his own life when delving into his writing for films. A long road trip as we see in the first Vacation or in Planes, Trains, and Automobiles (next year’s Thanksgiving film) for example. An adult and child duo surviving the hard way when they are down on their luck like in Curly Sue. There is also the theme of unique family situations and how they get along during the holidays as we see in many of his films. He may have correlating themes in many of his films but that is hardly a problem when they were all so great. 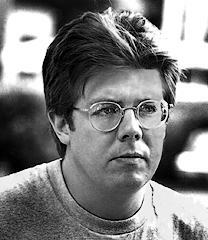 John Hughes was a great writer and filmmaker who left a significant stamp on the industry and our culture in this country. He was a significant loss a few years ago but we will always have his many movies to carry on his memory into the future. Ed O’Neill may go into full hobo mode a couple of times in this film but I don’t think the film would have been of any count without him. He never really got off the ground with a significant film career but he has always been a big player when it came to acting on television. I was never a fan of Married with Children because it was just too much toilet humor for me but it was still a big hit by and large with TV watching fans. After airing for ten years the show made its mark and did plenty to entertain many people despite what I thought about it. He is now starring on another hit TV show that is arguably already more famous than Married with Children ever was. I am not the biggest fan of Modern Family but it is a funny show and I specifically like him on it. O’Neill has a real natural quality about him that makes him very likable. I think he was a perfect fit for the “working class” man he portrays in this movie and I think he is really funny in the part. I think if someone else would have been cast in the part of Dutch the movie may have been more successful when it came out but I don’t think the movie would have been better. Ed O’Neill makes this movie worth watching. Everything from him carrying Doyle out of his school against his will to continually getting beat up by this child and right up until the end when he pulls the air gun on Doyle at the Thanksgiving dinner is hilarious. This movie was both a critical and financial flop but it has gained a small amount of popularity over the years and I think that has a lot to do with Ed O’Neill’s performance and how he carries the film. It’s funny but it wasn’t until I looked this movie up on IMDB that I realized Ethan Embry was the kid who played Doyle. I have seen Embry in a number of films over the years but had no idea he was Doyle because he looks so different as an adult. The character he plays in this film is a bit too much as far as douche bag kids go but he comes a long way by the end of the movie. Shooter McGavin is present in this film playing the adult douche bag type of character that he plays so well. It’s nice to see Dutch get the last laugh on this guy at the end of the movie. I actually like Christopher McDonald but he finds himself in this type of role all too often and it seems too easy for him to pull off. This is a funny movie but things get to be a bit too dramatic near the end as things continue to get worse for Dutch and Doyle. When I was a little kid I specifically remember having this phobia about being lost on the road. I once rode through Washington DC with my grandmother and nearly panicked when she got lost in downtown thinking we would never find our way home and we had neither food nor water. My parents used to love telling that story as one of those adorable things kids will say anecdotes. Yet I remember really being afraid and when I look back now I think it was because of this movie that I got scared. I know for a fact I had seen this movie more than once long before that incident took place. Having seen what Dutch and Doyle went through when they were on the road and had run out of both money and luck put a specific type of scare in me. It was the irrational type of fear only a small child can feel but having pinpointed where it came from years later is really interesting. I think the fact that this movie made me paranoid about something like that as a kid says something about how dramatic the tone gets near the end. I always think it is a mistake for a comedy to get dramatic. It really just sticks a fork in a completely opposite emotion and makes it really difficult to get back in the right frame of mind for laughing. It makes sense in the story for Dutch and Doyle to be turned away from a restaurant because they look homeless or for them to have to stay in a homeless shelter because they have been robbed. It makes for a better story but it does nothing for the comedic tone of the film. As I said earlier this film was both a critical and financial flop. So much so that Married with Children actually made multiple references to it over the years and made fun of it for being a failure. You have to appreciate Ed O’Neill for being a good sport and being able to take shots at himself. I actually happen to think there is a lot to like about this film and really enjoy it. I understand why it didn’t succeed though and think it was for the very reasons I have discussed already. Ed O’Neill didn’t have the street credit so to speak to fill the theaters and the film takes too much of a dramatic tone at times. What I haven’t discussed is the nature of Doyle’s situation and how it relates. While I have seen plenty of comedies succeed while covering the complications of divorce I feel like it is a really difficult thing to do. It worked in films like Mrs. Doubtfire and It’s Complicated but having grown up as a child of divorce I tend to find these films difficult to watch. Some people may like them but I don’t think there is anything funny about divorce or the lives the survivors have to live afterwards. Doyle is very much a troubled kid and it’s the direct result of his upbringing. It’s nice to see the light come on for him and to see his life appear to get much better, but it can be a painful reminder of reality at the same time and reality never has such a happy ending. Despite its dramatic elements I still really enjoy this movie. I think Ed O’Neill is so funny and has so many memorable scenes I freely overlook the type of things that would otherwise turn me off of a film. Nobody makes a holiday classic quite like John Hughes and while this hardly qualifies as a holiday classic we do see a turkey by the end of it and I insist that makes it count. Thanksgiving may get overlooked sooner and sooner every year but when the day finally comes it’s still here and it’s still as great as it always was. It’s a wonderful time to spend with family and friends and to break bread together. There really wasn’t any reason for us to do a film for this holiday either because this holiday isn’t for movies. It’s not a date movies are released to theaters on and it’s not a good time slot to play films for TV ratings. That’s because this holiday is about family, food, and FOOTBALL. As the big movie fan I am I am here on Thanksgiving telling you not to watch a movie today but to tune into the NFL and watch Megatron or the Cowboys or this year’s hopeless Super Bowl champs tonight. Spend time with loved ones and enjoy the day while it is here, in the blink of an eye it’ll be back to business as usual and we’ll all be Christmas shopping.